The closest I ever got to mooching off a friend’s family vacation and vice versa was the time my friend Laura and I spent a weekend at my dad’s house and went to Six Flags. A month or so later we went to her dad’s farm for the weekend. There were no mysteries to solve. We got jipped. Heh, because I am still on winter break from work/pretty ill. Pretty much I am alternating between doing recaps and obsessively watching Lost. I want to quite my job and do this all the time. I went to a lake cabin with my friend and her parents. It was just two girls, so that wasn’t much to handle. That was my only friend family vacation mooch. I really loved Steph’s (?) bangs in this cover art (blue nightshirt). That was my dream hair in 6th grade. Um, I HAD that hair in sixth grade. Along with a hot pink Gitano sweatshirt. I know, Stephanie’s one freakin’ attribute that they constantly harp on is that she always wears red, black, and white — if they can convey their hair colors/styles to the cover artists, really can’t they tell them that too? Is this the only one with a ghost story? For some reason, I was remembering the ghost story one as being a Patti book. I remember reading it in the guest bedroom at my aunt’s house when I was like 8, and being as ridiculously easily scared as I am, I refused to sleep in that guest room again until she moved out of that house. Which was when I was, um, like 23. I think this is the one I remember! The cover looks very familiar. Were there boys in the book who played pranks on all the girls? Like making them eat worms? I actually went on some truly amazing trips (all camping) with one friend of mine and her family while I was growing up in Colorado. Camping doesn’t sound too swank but they were seriously set up for it. The kind of camping where you took a ton of supplies and tents and food and then drove way out into the middle of nowhere in the mountains and then hiked a ways from the van to be near the river or lake. These are some of my best memories as a kid. She also had two awesome older sisters that I idolized (since I was the oldest of two brothers) and they both had off-road motorcycles that they would bring with them on the trips. When they weren’t being super bitchy they would take us for rides. It was so great. I can’t remember a time I used my imagination outdoors (I usually reserved that for indoor activities it seems) or had more freeing childhood fun. We also always used to stop and get these amazing sopaipillas at a roadside diner when heading back. I’m sad to say I used to look forward to that more than anything else…yet that memory is the lamest part of it now…strange. ihatewheat, so unfair you had such awesome 6th grade hair. I find it really weird that I KNOW I read all of these Sleepover Friends books, but I just can’t remember a thing about them. Even when I read the re-caps, it brings nothing back. I blacked them out or something. I am slightly concerned. When I was back home visiting my parents over Christmas, I even tried to search for copies so I could re-read but they have mysteriously disappeared as well. Hm. Oh man, I had totally forgotten about the existence of this series. I’m pretty sure I used to read it, though. Just discovered your recaps and love ’em – even though I didn’t read this series. As a rabid Babysitters Club and Girl Talk fan, I can totally appreciate the group vacations, fantasy parents, and excessive junk food consumption. 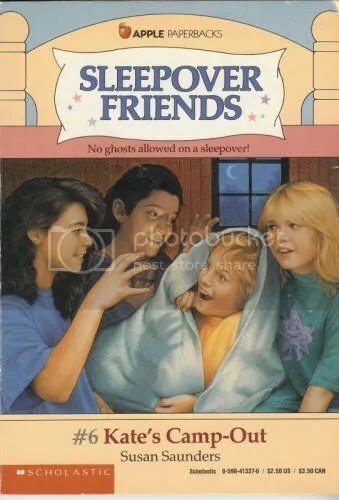 And “Sleepover Friends”? My best friend from 7th to 12th grade didn’t like sleeping anywhere but her own house and I’m still a little bitter.